The Fiat V6 was a cross-flow V6 with a 60° vee angle, twin-overhead camshafts and a toothed belt like the L4 128 engine. The engine underwent development and increased in capacity to 3.2 litres. That’s the engine which Lancia might have used. The 2.8 litre engine achieved 140 bhp which the press considered insufficient. Off the top of my head the 1969 car managed about 22 mpg. The enlarged engine managed 165 bhp and at least similar fuel economy. The Fiat V6 also drove the rear wheels and had its exhaust pipes mounted on either side of the centre line, leading me to imagine longitudinal mounting. So, that’s the Fiat V6. 1998 Volvo 960 estate headlamps and grille. PRV6 found under that bonnet. Let’s turn to the PRV as used in the earlier Lancias. Like the Fiat engine it was originally deployed in rear-wheel drive cars so that maybe means it doesn’t matter for an engine which wheels are to be driven. Plus: The 90 degree engine could be shorter and lower (says Wikipedia) so it takes up less space. Negative: the uneven firing order of 90 degree engines has to be addressed by “split crankshaft journals to create evenly spaced ignition events. Wikipedia alleges the initial version of the Lancia PRV6 has these characteristics: It produced 148 bhp, less than the Fiat’s later iteration. The torque produced was 181 lb ft, nearly the same as the Fiat. The Lancia produces its max torque at 2700 rpm versus the Fiat’s 3400 rpm. Something tells me that the PRV thus produces at least as much power as the Fiat engine but earlier – that means it gets through the gears faster, if my engineering knowledge is not all rubbish. The Thema weighed 1300 kg. The end result is still a miserable 22 mpg average fuel consumption, even with the lardy 1600 kg Fiat 130 saloon. The PRV weighed about 150 kg; I could not find a figure for the Fiat engine. The Thema V6 had a nought to 60 speed of 8.2 seconds, one second faster than the Fiat. All in all, the case for the PRV is not outstandingly clear: marginally more torque lower down, acceptable fuel economy, acceptable performance and a compact size. Perhaps the main argument going for it was that it was in production whereas the Fiat 130 wasn’t. The tooling was probably scrap by 1984. So, Lancia was able to benefit from economies of scale. That, more than anything else, I feel was the deciding factor along with the details that it was a marginally better engine. (Author’s note: Be aware, gentle readers, that I wrote this late on the night of Friday the 25th of January without having the chance to read answers to Bob’s question. Then I went off for the weekend having scheduled this for today. Maybe in the interim better answers will have been proposed – I have not been able to accomodate them at present. This is my bid, for what it is worth). Lampredi’s V6 surely is not based on his engine design for the Fiat 128. These engines share a head design typical for Aurelio Lampredi at that time and mabe that’s what Wikipedia meant. To his ever lasting credit Lampredi made OHC engines mass production compatible with his patented solution of valve clearance adjustment by shims positioned on top of the bucket tappets and therefore easily exchanged without the need to remove the camshaft as in old (D)OHC designs like Alfa or Jaguar. Both engines also have a typical two piece ‘layered’ head design with one casting carrying the wedge shaped combustion chamber, parallel valves and inlet and exhaust ports and another separate casting carrying the tunneled camshaft which was easy to manufacture and to handle on the production line. This engineering detail is common to the 128 SOHC as well as the 130 V6 and the big four cylinder 124 DOHC Lampredi engines (the last of course without wedge shaped combustion chamber but still with separate camboxes). On the 128 engine inlet and exhaust ports are on the same side of the engine, resulting in the exhaust manifold actually being on top of the 128’s forward tilted engine. The 130’s engine has a cross flow head and because its valves sit at an angle to the bore’s longitudinal axis and are pointing inwards of the vee (keeping the engine slim), the exhaust port has to pass a (estimated) 130 degree bend inside of the cylinder head to meet the flange to the manifold (Porsche’s 928 engine in SOHC form had the valves pointing outwards, resulting in a very wide engine but good porting for the exhaust and inlet ports simply pointing vertically upwards to an enormous piece of inlet plumbing). This exhaust port design is very inefficient and prevented the engine from developing real power. In addition to this there typically is very little room inside the vee of a 60 degree engine for the carburettor/injection arrangement. Carbs more or less are sitting on top of the engine rather than in the vee (look at the Dino V6 with its asymmetrical head design and 65 degree angle to create room for the carburettors or at the plumbing of an Alfa V6). Dave: please, please put this knowledge in a book. You can theme it by engine format, or nationality or maybe by market sector (which makes most sense to me). Then tell the story in chronological order, where necessary explaining the factors driving the design choices. Period: 1950 to 2000? Five Decades of European Engines by Dave Surname. DTW Press, Great Malvern, UK. the english Wiki article is not completely trustworthy, I’m afraid. The 60 deg. Fiat 130 V6 engine originated from the 65 deg. Dino V6 engine (it had similar bore spacing and some other basic similarities). What actually caused this, was the “Evo 1” versions of those crossflow heads being *again* modified later on, as their crossflow arrangement created ancillaries-packaging issues for the 130 engine bay. This required a further redesign of their ports/flow pattern, so, according to relevant sources, it was this aspect as a “shoot your own leg” factor for the detrimental V.E. (and consequently Mpg, transient-response and overall bhp/litre etc.) of that engine. Pity, as, in terms of its out-of-car compactness, smoothness of running, and sheer lack of inner friction, it was positively period-incorrect for that time (actually Lampredi created “science-fiction” levels of low friction, for the era… or was it “science-friction”?). late changes that “suffocated” the head flow pattern. I felt that this needed to be underlined in a concise manner, sorry for this “lengthy nut” on the thread. Thanks – what is V.E? And none of that information is to be found at Wikipedia (that´s my level, alas) , so where did you find it? The Fiat 130 engine being identical to or based on the Dino V6 is an urban myth. Look at the engines and you see more differences than commonalities except the fact that both are V6 designs. The Dino is pure race engine (tamed only marginally by Lampredi at the time it went from 2.0 to 2.4 litres and from aluminium block to cast iron) with its ability to rev beyond 8,000 rpm on a regular basis (and needing in excess of 6,000 rpm to deliver real power). The Dino also has no typical Lampredi engineering details except the shims on top of the bucket tappets of late 2.0 and all 2.4 versions. Lampredi could be very stubborn when it came to design alterations to his engines. The main problem of competition Fiat 131 Rally Abarth cars was severe lack of power because of porting restrictions caused by the head bolt placing. When Abarth engineers secretly changed this, enabling better breathing and a 20 hp performance gain Lampredi immediately stopped any work in this direction and any performance improvement had to wait until the 037 supercharged engine. If “science friction” was intended as a musical reference, then “she’s so [over]square” would complete the trifecta. Coincidentally, Lampredi retired in 1977. I’ll second that – come on Dave, it’s what we need! There’s certainly space for it on my bookshelves. I imgine Dave could probably write most of it without being bogged down by needing to check references. The 1998 Volvo, as displayed in the article, was powered by a straight six engine of either 2.5 or 2.9 litre capacity, belt driven and with DOHC. Volvo were moving away from the PRV motor by the early nineties. The new engines were Volvo’s own creation and known internally as B6304. The busiest unit produced 204hp at 5,200rpm, and peak torque at 4,100rpm. The American market received a version with a milder cam which offered only 180hp but probably better suited the easy progress one tends to make with an old school four speed automatic gearbox, 1600kg, and a softly sprung chassis. We have a 960 which is still easing its way across the UK in tremendous comfort and continues to give dependable motoring. The power delivery is amusing for being so at odds with the rest of the car’s specification. Progress can be flat out and fizzing, or just flat. Thanks for that. I need to find an image of an earlier Volvo 760 then. Aren´t they really, really lovely cars? I think of them as European Buicks. North American cars had the 201 hp white block in the 960 thru 1994. The change to the 182 hp was in the 1995 model year. My mother has a 1995 960, and that engine is absolutely optimized for North American drive patterns. I have a 1990 W124 Mercedes with a M103 3.0, and the power delivery is very similar to the 182 hp white block. I would like to know Dave’s opinion on the complexity of the Audi W12, VW W8 & VR6 plus at the opposite end of the scale the 2CV engine. To say nothing of the Napier Deltic or Nomad. The version of the Nomad that actually flew used a flat 12 two stroke diesel (with afterburning, a thing not commonly encountered therein) as the combustion chamber of a gas turbine while the Deltic was a triangular opposed piston two stroke, each element of which had six pistons, three crankshafts and three cylinders. (In the 90s, I used to work with the Fiat 128/Ritmo/X1-9 engine modifications for racing, for ~10 yrs, thus have accumulated certain hands-on background with the Lampredi engines). It’s also fair to say that a certain veil of obscurity exists when it comes to the 130, and especially its engine (apparently it was not pleasant for Fiat to elaborate on such an well-conceived but ill-fated engine design). Al: According to LJK Setright, who tended to know his onions, the roots of the Lampredi belt-driven SOHC four can be traced back to a racing Abarth engine from the latter ’60s. Carlo Abarth then reputedly built a single-camshaft version for Fiat, which served as a prototype for the X1/1 or 128. During Setright’s sojourn in Texas during the 1980s, he obtained an X1/9, and upon the advice of racing tuner Alfred Consentino, made a series of improvements, one of which was a tuned version of the little 1.3 litre which with a ‘hotter’ camshaft and a few other revisions developed 130 bhp at 7000 rpm, with what LJKS described as ‘enormous mid-range pull’. According to Setright, this basic engine, duly modified for forced induction, also powered the very quick and well-regarded (at the time) Uno Turbo ie – which was at one time intended to be fitted to later versions of the X1/9. On the subject of the Fiat 60 degree V6 by the way, Abarth was said to have shoehorned a 3.5 litre version into an X1/9, producing what LJKS described as ‘a comfy 280 bhp’, and entered it into the week-long Giro d’Italia, where it finished second. But it would seem that for the little mid-engine Fiat, as with most things in life, less was more. Anyone ever considered hosting a DTW conference? Good stuff. Is it Dave or Al for the win on this one? I can’t judge, but it seems obvious one has more hands-on experience. The PRV V6 was a lightweight boat anchor in all the Volvos I drove with it, while hustling along very well in a Renault R30. You’d think it wasn’t the same engine. More likely the car, the Volvo was a steady old heavy plodder of no particular merit, and my provincial tastes never encompassed bunched leather in the 262C the Volvo dealer tried to unload on me – With that roofline, it looked like a bowler hat on top of a checked shirt and polyester trousers. Sell, they did not, which is why I was offered the deal of the century. A great deal does not compensate for mediocrity so I had zero trouble passing that one up. And as a 90 degree V6 that was initially supposed to be a V8, the PRV’s compactness was not its forte in that it wasn’t compact. Quite what were its plus points, I was never able to establish. It sank without trace here, and nobody held a funeral service, much less wrote and orated a eulogy. Chrysler ditched the Renault PRV V6 version after buying AMC/Renault, as its 3.3 litre ohv 60 degree iron V6 was livelier and more compact, and then made a 3.8l version of that engine that I really liked. Since the end result is all that really matters, and since some products/items just give superior performance without anyone really completely understanding why, I offer the heretical viewpoint to Europeans that the iron block 3.8l Chrysler ohv V6 of the early ’90s made mincemeat of the PRV V6 without even trying. It ran Chrysler minivans around with a burbly exhaust note, a clean even pull and a great deal of liveliness when pushed. All 180 hp of it. Not everything has to have overhead cams to be nice. As alloy Chevy V8s prove to this day – the 6.2l is a monster of power and torque that makes 2500 kg trucks jump in a silly manner (0 to 100 mph in under 15 seconds) with 420 hp and associated torque, but is compact as all get out in physical size. It also has 17 different combinations of cylinder deactivation to avoid thermally messing up the alloy block and for a spot of reasonable fuel eonomy compared to the Ford twin turbo V6, and chunters along on two cylinders a lot of the time. I’m not aware that any BMW or Mercedes V8 engine in quantity production is as lightweight or as compact what with twin turbos and hubris, but the possible howls of derision from Europe I can only count as unfamiliarity with an engineering triumph. And the supercharged versions are just plain silly with power. Brains don’t stop at the Bay of Biscay, oops, western Ireland. I don’t know how tax and insurance prices are calculated in USA but in many european countries they depend on cylinder displacement (e.g. 30% tax for cars with engines bigger than 2 litres) and recently also on test CO2 emission. These are reasons why european engines have huge heads with twin camsahfts and variable timing and lift and turbos. When speaking about the ‘invisible advantages’ of a 90 deg. V6, first of all – let’s face it, it IS a clear disadvantage and a hard engineering compromise (if not a downright a flaw). For all its drawbacks, however, a 90deg. V6 engine still has one crucial advantage over a narrower angle (be it 60, 65, 15, or the F1ashionable 72 degrees…) – and that’s precisely the huge space available between the banks, making all sorts of exercises about tuning the inlet runners/chamber volume/resonance way easier – thereby, if a good engineer is in charge, a 90 deg. V6 could yield serious performance benefits just from the intake plenum optimisation scope that it offers in spades. Seemingly, on first sight, the intake is not all that important. But as one delves deeper into the furthest, mystically detached corners of the ICE performance envelope, it becomes quite obvious that, apart from the obviously crucial science of the combustion process, the second single most important aspect of any performance engine is the suitability of the intake pulse “orchestration” to the gas cycle timing of that very V.E. package : cams/heads/internal geometry, piston dwell dynamics at TDC/BDS (rod-length/stroke etc. etc..). It is exactly the reason behind the huge popularity of the 180 deg. V-engines and opposed (a.k.a. Boxer) engines. Besides some obvious friction-related benefits of these engines, the foremost advantage is the practically spatially unlimited possibilities of designing & building THE perfect intake plenum & chamber for the given engine its V.E. package. overcharged engines (Turbo- or Super- /charged), it’s perhaps one of the secret ingredients of the PRV that made it so suitable for the Turbo-applications, most famous of which are the MVS evolutions of this “Frankenstein” amputee of a V8. are favorable for a straighter “shot”. Whether and how did PSA/Volvo/Renault/MVS engineers at all managed to use the above potential advantages, is rather difficult to assess, without having someone here who has spent a significant time “sleeping” with these openhearted mills, to tell us the true inside story. Of all its installations, however, I find as most bizarre the XM one, as, with the impossibly tight access to anything in most any XM engine bay, the untoward, too wide V-angle made things even more of a cartoon, covering everything and filling your subconscious with “engine out to replace oil filter” nightmares on long days. a single 2-3 hrs spirited drive on a good day. On a closing note, I share wholeheartedly Bill’s appreciation of the Small-block GM (LSx) engine philosophy – its simplistic roots notwithstanding, it has been developed into what’s probably the pinnacle of today’s real-life reciprocating engine performance, and is still the King in almost any discipline, especially in the crucial “triangle” : Weight & Size vs. HP/ltr. vs. $$$. Engines. Best avoided as a topic, best enjoyed at WOT. One of the big downsides of the DOHC 4 valve V8 or V6 vs pushrod is the sheer physical size. Pushrod for a given peak hp is usually lighter, has a more street friendly torque curve, usually marginally better fuel economy, and is certainly more compact. I agree that pushrod engine will be smaller and lighter than a DOHC one for given power, but quite modern (i.e. engine optimized for driveability rather than peak power) 4 valve engines have generally flatter torque curve than 2 valve ones. Also i think that due to better flow in 4 valve head 4 Valve engine should have lower fuel consumption. 4 valve pushrod engine sound like a good compromise but for pentroof chamber valve train became very complicated so all 4 valve pushrod engines which I know are rather big diesels. Four valve engines naturally have a peaked torque curve, which is typically at max at 6000 rpm or higher, given a camshaft that actually takes advantage of the airflow potential. Since most street miles by most people occurs in the ~1800 – 3500 rpm range, 4 valve street engines need a number of changes to get peak torque and peak brake specific fuel consumption per hp to occur at a reasonable rpm: typically, variable cam timing and or valve lift, variable intake length/diameter, variable intake volume… etc. A two valve engine doesn’t need any of that stuff. My question: if you design an engine with a totally inappropriate rpm range, and then do a lot of add-ons to get it to streetability, and the engine is now bulkier and heavier than a 2 valve pushrod (not to say more expensive), why is this considered “better” ? “Multi-valve engines have mainly 3 advantages. Firstly, it increases the coverage of valves over the combustion chamber, allowing faster breathing thus enhance power at high rev. Secondly, it allows the spark plug to be positioned in the center of combustion chamber, enabling quicker flame propagation, more even and more efficient burning. Thirdly, using more but smaller valves instead of two large valves means lower mass for each valve. This prevent the valves “float” from its designed position at very high rev, thus enabling the engine to rev higher and make more power as a result. 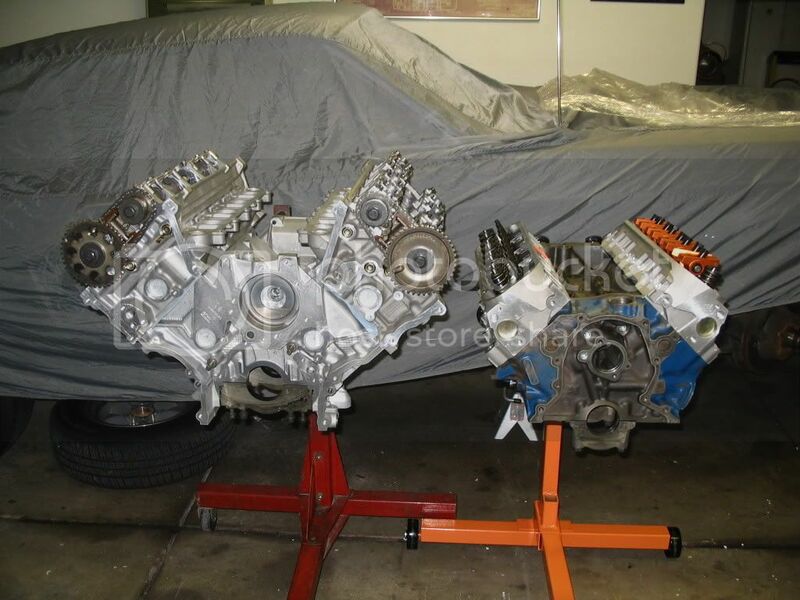 A comparison of the 4-valve head on BMW M3 V8 and the 2-valve head on Chevrolet small-block V8 finds the ((BMW V8)) has larger percentage of area covered by valves. The spark plug is positioned centrally in the 4-valve head, unlike the case of 2-valve head. Angel: I should add that what I get from this information is that after all the workarounds you get an engine with better performance and lower fuel consumption. The cost some complexity. In the end, neither is objectively better. It depends on whether you like simplicity and aren´t bothered about fuel consumption. In the European context, even a smallish difference in potential fuel consumption would be enough to justify the effort. For the US, the argument is weaker. Richard. I question both the better fuel consumption and performance. In this report they go thru all the possible technology changes and costs for decreased fuel consumption for various types of dohc, ohc, ohv engines. The incremental gains for all formats are almost identical. Also, nowhere does it say, scrap all pushrod engines, go to dohc, and save x% fuel consumption. It is hard to get accurate maps of current production engines, but my impression from the past is that brake specific fuel consumption per hp is very, very similar between dohc and pushrod naturally aspirated. What that means, basically, is that engines of similar hp in the same car will have very close to the same mpg. Angel: this is probably a case where the interest lies in the actual consequences of the word “almost”. It may very well be that for some purposes a small difference was enough to choose one engine concept over another, and by the same token, not large enough to outweigh another advantage outside bhp and fuel economy. I imagine that this whole business is about engineers curious to see what happens if they do X or Y. We seem to be at the end of range of options and have discovered the relative merits of each principle concept. All of them seem to be about okay and have their advantages and disadvantages. I wonder if the improvements over time were as much to do with other aspects of engine design as with the valve count! So, when we compare V1 of a single valve engine with V1 of a multivalve engine only we are ignoring how good V2 of the single valve engine might have been compared to V1 of the multivalve engine. Richard, if you look at the extremes of pushrod 2 valve vs dohc 4 valve development (2006 NASCAR and F1) the differences in some metrics for the engines are surprisingly small. Yes, the hp/liter of f1 is higher, but the average piston speeds are the same and brake mean effective pressure (BMEP) are within 0.5 percent at peak torque (about 5 percent at peak hp). That says to me, related to your point of V1 vs V2 valve count vs other changes, that if you develop both formats in street engine form to the max, you end up with the same piston speeds, and the same torque per liter. So, for the same hp, with the 2 valve engine you end up with a lower rpm engine with more torque, and, i argue, an inherent torque curve that makes more sense for a street driven car. I am going to continue to search for BSFC maps for ~120 hp engines, which is the format most relevant to high fuel taxes markets like europe. I’d like to quantify exactly how much the DOHC fuel economy advantage is, although the BMEP at peak torque suggests to me how small it really is. I disagree that 4 valve engines have peaked, high rpm nature. Id depends also on many other things and details (angle between valves, intake and exhaust design and so on). 4 valve engines is common since 90’s and these engines have peak torque ca. 3500-4000. Of course they were designed for it, they aren’t racing engines. There are also industrial 4 valve diesels with peak power around 2000 rpm or lower. Many old 2 Valve racing engines also have high peak torque rpm and very narrow usable rpm range. 2 valve pushrod engine could have bigger cylinder displacement with smaller external dimension than DOHC one which could result in better driveability of pushrod engine. However there are markets where each additional ccm of displacement or g of CO2 emission is very expensive. Ok, found something. Scan resolution isn’t very good, but nevertheless. page 12 shows the BSFC for a 2 valve engine. If the difference is ten percent for a given hp level, that is definitely significant for high fuel tax markets. You can also see from these graphs why they are using 8 or 10 speed automatics. They want to constantly reduce rpms and increase engine load because fuel consumption is lower with lower rpm and higher load. Thanks for creating the article, along with the answers. From reading Dante Giacosa’s account of what became the Fiat 130. It seems the project drifted from originally being a direct replacement for the Fiat 2300 into a car that basically belonged to the segment above, yet featured a relatively small engine in the V6 (with Giacosa drawing comparison between the Fiat 130 and pre-war Fiat 2800 as both being too big for their engine sizes). One wonders whether project drift had a negative impact on the development of the 130 V6 along with Lampredi’s stubbornness, thereby compromising it’s potential for Fiat’s 130 V6 to be a modern, near ubiquitous analogue to the (V8-derived) PRV V6 and Alfa Romeo V6 to be used across much of the range (as well as an indirect successor to the Lancia V6). Though the 2.4 Dino V6 was said to be ill-suited for use in Fiat’s saloons (even if further detuned by another 20 hp or in a Fiat Dino-based saloon? given the comparable length of the latter to the Fiat 2300 or any proper replacement. ), it does feature the sort of lower-end displacement range one of have excepted from a properly-developed Fiat V6 (albeit with scope for further enlargement to 2600-3000cc+ as well as specifically created 2-litre Italian tax specials). It’s interesting to learn that the Thema, which as I recall as quite a large car and one which was removed from the Irish market just as it was becoming a relatively common sight, weighs about the same as a current Focus. Lancia did quite well in Ireland, didn´t it? There was Ambrose Glass selling Fiats and Lancias in Dublin and I remember seeing a decent number of Themas, Dedras and Deltas about. Abandoning the RHD market was a silly thing to do. The rot begin to set in around then: 1994 or so? And yes, the current Focus is like all modern cars, pretty damn heavy but I would suppose a lot safer in a shunt. By odd coincidence, I saw a 94-reg Thema driving through Kinsale yesterday. It was towing a trailer and looked well used, but hearty. This has turned into a very interesting resource. I have learned a lot! Much of this has already been said, but I wanted to comment nonetheless, to caution Richard against falling for Wikipedia’s inclusion of the Volvo 960 on their list of PRV-powered vehicles. While I’ve thus far refrained from editing the Wikipedia article, I’ve never been able to find any evidence of a PRV-powered 960 (including the citation previously used by the Wikipedia article, which didn’t actually substantiate the claim). So I’m very curious if anyone has any evidence of such a vehicle (outside of the flawed Wikipedia article). And I’m pretty sure Richard hit the nail on the head re: Bob’s question in the earlier comment thread–by 1984 the tooling for the 130 engine would have been long-since scrapped. Had it somehow outlived the 130 (in the Montecarlo for the USA market, for one hypothetical example), I have no doubt it would have been easily adapted to FWD installations and found its way into the Thema and other Fiat Group products. I’ll also second the assertion that any relationship between the 130 engine and the Dino V6 is an urban myth. Regardless of what Al may have been told by folks at Fiat, there just isn’t anything at all (aside from Lampredi tappets) in common between the two designs. (Hopefully it goes without saying that similarity in bore spacing between a racy ~2L V6 and a relaxed ~3L V6 could easily be a coincidence–I’m reminded of the laughably persistent urban myth that the Bentley L-Series V8 was a licensed copy of some American design even though, if you actually look at them, they had zero similarities outside of that one key dimension.) With all due respect to Al and his Fiat contacts, I work for a big, storied corporation with a lengthy history of building complex engineered products, and you wouldn’t believe the flawed ‘history’ that some people (respected technical experts in their respective fields) are willing to confidently share about our products! I’ve embarrassed myself more than once by repeating something I was told by an expert who’s worked here since before I was born, only to eventually dig up historical documentation to the contrary.